Is This The Future Cult Classic That Blue Us All Away? One day, we're talking about what Volvo needs to do to stay relevant these days. The next, we're seeing what Volvo, err... Polestar, is doing to make Jalopnik readers giddy. 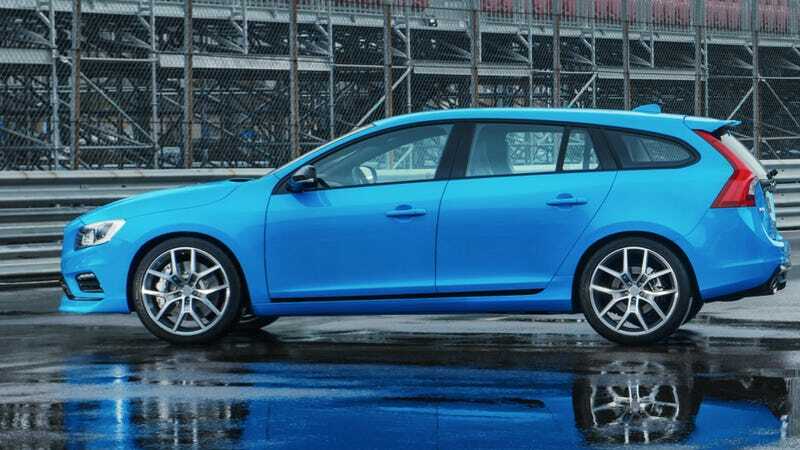 Wasn't the Volvo V60 Polestar nice to wake up to today? But who's going to actually buy one of these? Like, 7 of you, probably. That's OK, because some cars can languish on lots when new and live a happy existence in the pages of automotive history later on. Not sure what it is, but I've been stepping all over Saabarus lately. Moving to Boston might be a contributing factor, but it is a very loved cult car of the last decade. Volvo says they'll only sell something like 5,000 V60s a year in the U.S., or about half the number of 9-2Xs that were ever sold. The Polestar version is likely to be a very limited edition. Given the S60 bones, it might not be the sharpest around. But it'll be loved and sought-after. That's important, too. Runner-up COTD, however, goes to lzaffuto and everyone who tried to Volvo-ize the Eurythmics. See, look at the happiness a new Volvo wagon brings. Don&apos;t you mean "Swede dreams are made of these"?